An African wildlife safari is generally high on the bucket list of any eco-traveler. And, between Kenya, Tanzania, South Africa, Botswana, Namibia, Uganda, Zimbabwe and Zambia, there’s certainly no shortage of options! Each country is a popular safari destination in its own right. But, when presented with the opportunity to spend two weeks travelling through one of these amazing countries, we decided we couldn’t go wrong with a Serengeti National Park Wildlife Safari in Tanzania! 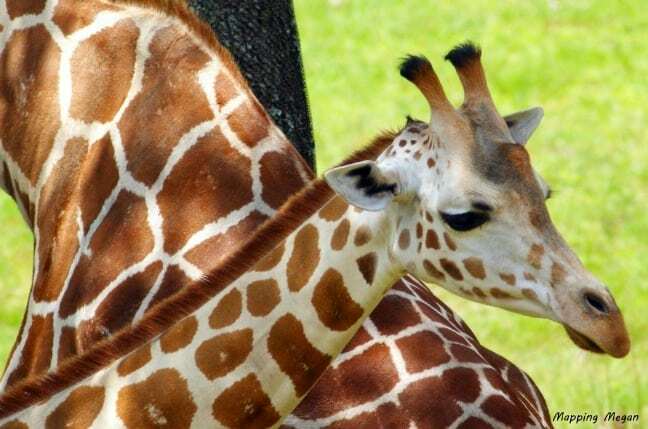 The tallest mammals on earth, Giraffes roam the African savanna constantly searching for food. 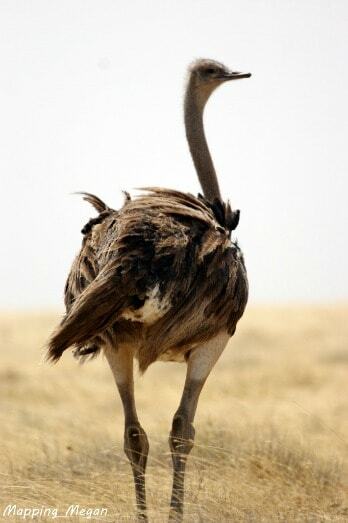 Their legs alone are taller than most humans, and it’s fascinating site to see them run. In what can best be described as a graceful gallop, they can generally move as fast as 35 miles (56 kilometres) per hour. 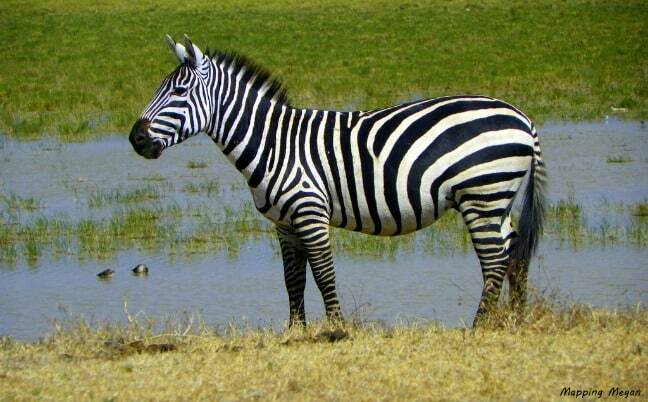 Zebras have it tough! They’re frequent prey for both lions and hyenas and, as such, are always on the lookout for danger. We witnessed a hyena attack a herd of zebras, and it was incredible watching how the whole herd came to the defense of one, circling around the wounded animal to drive the predator away. 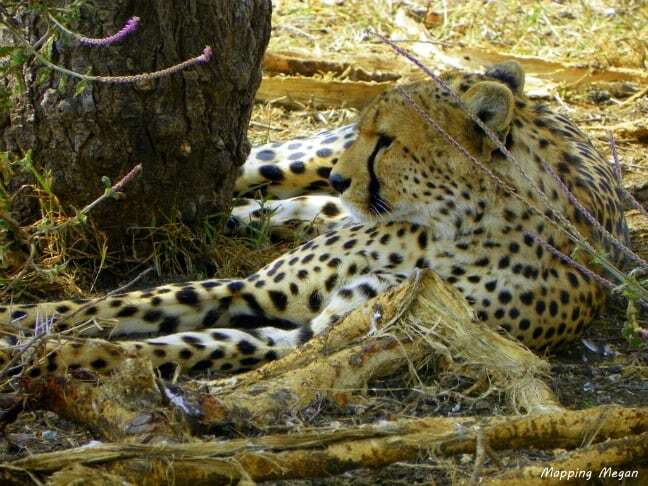 While the Cheetah is the world’s fastest mammal, sadly we didn’t get to see this one run. We were told that this cheetah was scanning the grasslands for prey (they have incredibly sharp eyesight), but he didn’t move a muscle for the whole 30 minutes we were there. We were reliably informed, however, that we would’ve been left in his dust, as cheetahs can go from 0-60 miles per hour (96 kilometres) in 3 seconds! Driving alongside the mighty Elephants of Africa is a phenomenal experience, and was definitely a highlight of our Serengeti National Park Wildlife Safari. The largest mammals on earth, these pachyderms are incredibly fond of water: We watched in awe as they sucked it into their trunks and sprayed it all over each other. 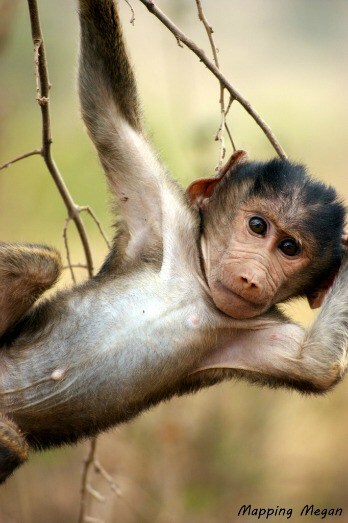 But honestly, if I was stuck living in the oppressive African heat, I would be doing the same thing! If you ever visit Africa, keep your windows tightly rolled up and your tents locked to keep Baboons from going through your belongings! There are few things cuter than a baby baboon, but they’re quick, cheeky, and will steal your chocolate biscuits before you even know they were there! While we were busy photographing this little guy, one of his siblings actually jumped into our safari truck through the sunroof, grabbed our biscuits, and ran off!! 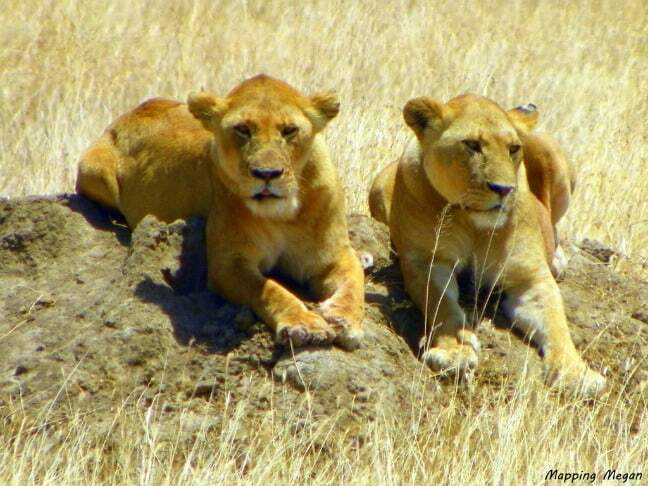 Female Lions often work together when preying upon antelopes, zebras, wildebeest, and such. They are not always as fast as their prey, so teamwork often pays off. 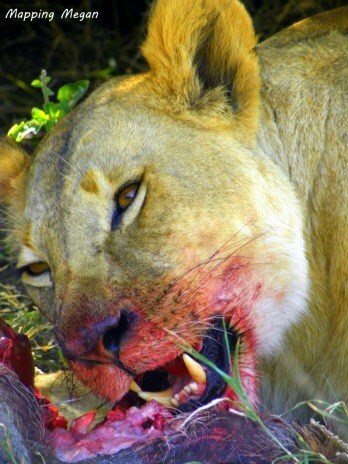 Males may be bigger, but lionesses are the primary hunters for their pride. Thankfully, we were safe within the confines of our truck when this one took down a gazelle. 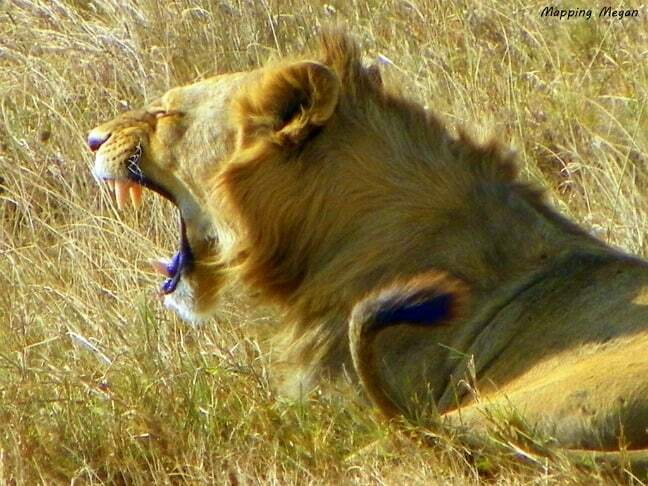 Defending his pride’s territory, the male lion is the king of the savannah (not the jungle!). Nothing can possibly prepare you for hearing a lion’s roar, and you’ll be extremely grateful for the safety of your vehicle when you do. But if you do happen to find yourself on foot within close proximity to a lion, DON’T turn and run! A running target looks like prey, and will be treated as such. Instead, make yourself look big and fierce while gradually backing away. 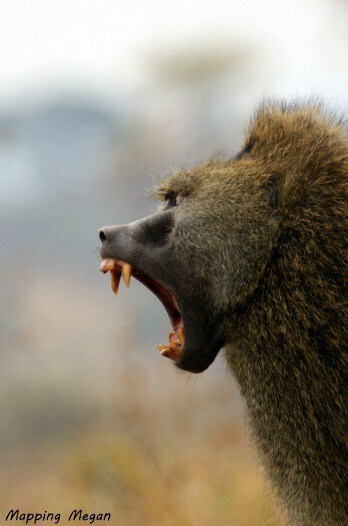 Baboons are the largest type of monkey in the world, and can be quite intimidating when angry. They spend the majority of their time on the ground, so they weren’t difficult to spot, and always seemed to be eating. Once we were back at camp, we had to make sure all our garbage was secured properly so that we wouldn’t attract the baboons, who can be quite destructive in their pursuit of food. Chances are good that you’ll smell a Hippopotamus before you see it. 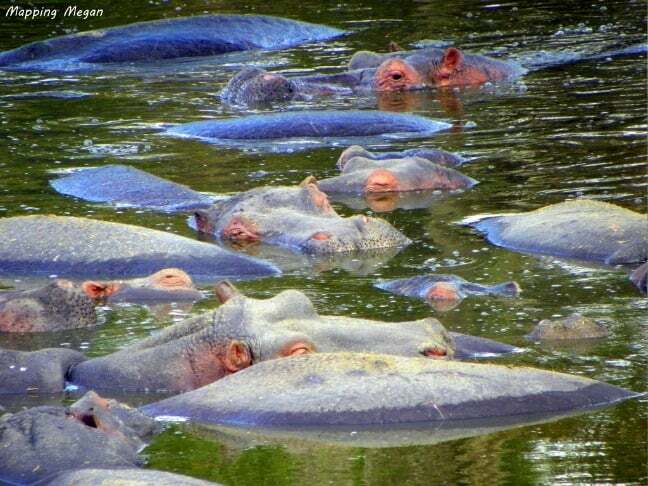 These massive mammals spend the vast majority of each day submerged in rivers and lakes to escape the African heat. While they are absolutely amazing creatures, we moved on rather quickly because of the stench! 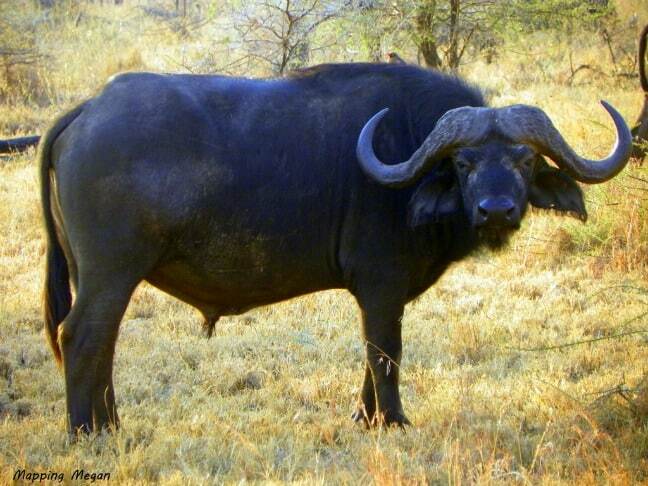 Water Buffalo are more dangerous to humans than any other predator in the African savannah, mainly because they’re unpredictable. They also have a reputation for being bad-tempered and aggressive, but they’re usually quite tame when in a herd. Still, watch out for their tendency to stampede en masse when startled! Elephants are magnificent creatures, but keep your distance. 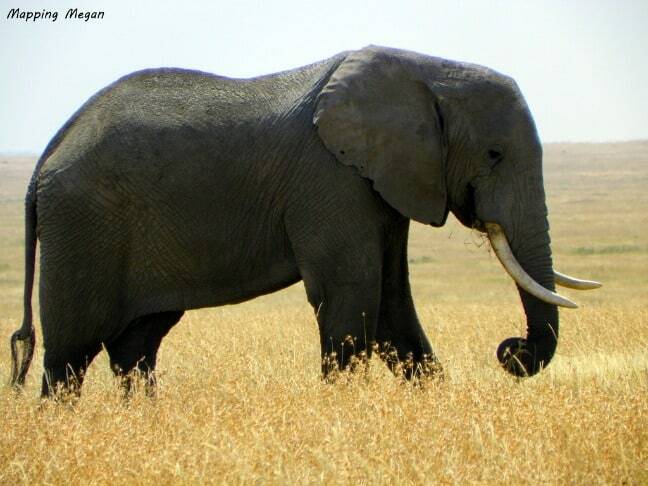 Wild elephants can be more dangerous than a lion, especially rutting bulls and mothers with young babies. 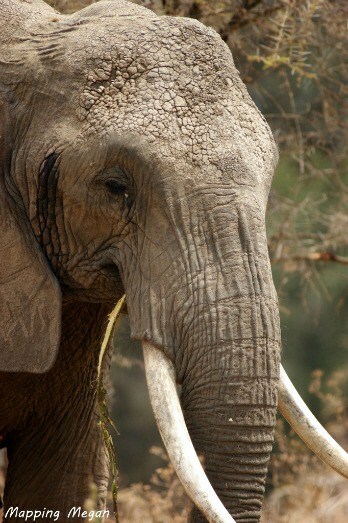 Remember that, if an elephant is flapping its ears and kicking up dust, there’s a likelihood it’s about to charge. And make sure if you’re in a safari vehicle that you always have a way to drive forward, as these behemoths can run faster than a car can reverse! !